As you might imagine, engineering the Form 1 required tremendous effort and precision. 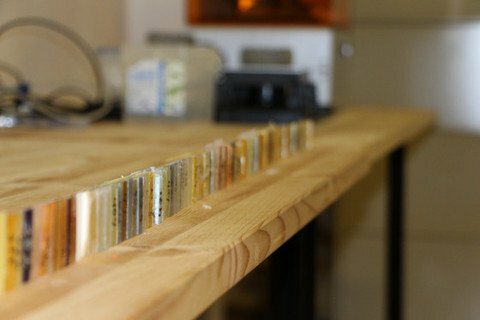 The same is true for our resin development, which we continue to fine tune before shipping. While the Formlabs team loves printing exciting parts (the tree in a previous post is a staff favorite! ), we’ve also repeated basic parts literally hundreds of times to test resin formulations and their properties. These parts allow our engineers to continuously tweak and improve our material for the best possible result. As you can imagine by the photos on this post, an exciting part of stereolithography is the multitude of resin possibilities. But resins aren’t limited merely to different colors. For example, properties can range drastically from extremely hard to extremely flexible materials, depending on the engineering behind the formation. This is why Formlabs sees a bright future not just in printer technology innovation, but in material innovation as well. For now, we are proud to present our first material, which can be used for a wide array of practical applications. Our engineers have lovingly nicknamed their creation “fluorescent grey” because the laser lights up the resin with a cool color when tracing each cross section of a print. Although we are still putting the final touches on the material, you can now find a preliminary MSDS on our website.